Bad habits usually do a good job! Many of us spend a lot of time trying to get rid of bad habits. You decide a long-held habit is ‘bad’ and no longer acceptable – a habit such as smoking, putting things off, eating/snacking, retail therapy, or talking too much. Then the battle begins, or ‘resumes’ because you’ve probably been here before fighting the same habit. The inner battle is between the part of you that wants to be free of the habit and the part that wants to keep it. As the struggle continues things ebb and flow – just as in a real battle. Sometimes the Habit Part is winning and sometimes the Give It Up Part is winning. You have successes, especially in the beginning, and moments of guilt-ridden failure. You share your successes with your friends and they applaud you. You share your failures with them and they sigh, give you that ‘I told you so’ look and try to sound sympathetic and supportive – even though they know you’ll never change! We’re going about getting rid of the habit the wrong way. Many of the bad habits we have difficulty in escaping from have been around for years if not decades. We’ve probably being struggling with them for most of that time. And each time we fail and slide back into the habit it becomes stronger – because our underlying belief that we can’t become free of it is reinforced. As a result, each new attempt to get rid of the Habit becomes more determined but less believable. This happens for two reasons. Each time we fail and slip back into the habit we lose our faith in ability to free ourselves from it. And, secondly, the more we fight the habit the more we become obsessed with it. Which is a pity because it would be better to become obsessed with the opposite to the habit – with what we will replace the habit with! For most of us, giving up a bad habit is usually a matter of trying to ‘not do it’. But that just makes it harder to stop. Trying to ‘not’ do something doesn’t work. Curiously, when you think to yourself or say to yourself ‘don’t do’ something the first thing that happens is you imagine doing it – and you then try to not imagine doing it. Repeatedly saying ‘Don’t do this’ makes you more focused on doing it! Now you think more about doing it, imagine yourself doing it, and almost feel yourself doing it. While trying to free yourself from the habit, you are actually strengthening the grip of the habit has on you. Even bad habits do a good job. They give us feelings good feelings or enable us to avoid bad feelings – or both. Yes, it’s true the habit may have its downside – it may have its side-effects – but, on balance, we put up with the downside because habit has become one of our ways to manage our feelings. I began smoking at about 16. I did it to look cool and to be like my mates – and, to me, that was good enough reason. And it did the job. At 16 you’re not bothered about your health because you know that you’re going to live forever. And you can always find the money. And ignore parental disapproval. Years later, the habit had generalised and was now, in my opinion, doing lots more for me… such as helping me to deal with stress, acting as a reward when I did something successfully, being close to others through smoking and sharing cigarettes with them, fending off loneliness at other times, and so on. Yes, the ‘looking cool’ bit had faded a long time ago. I was aware that it was an unhealthy habit and one that a lot of people disapproved of. It had become quite expensive, made me smell, even made me breathless, and so on. 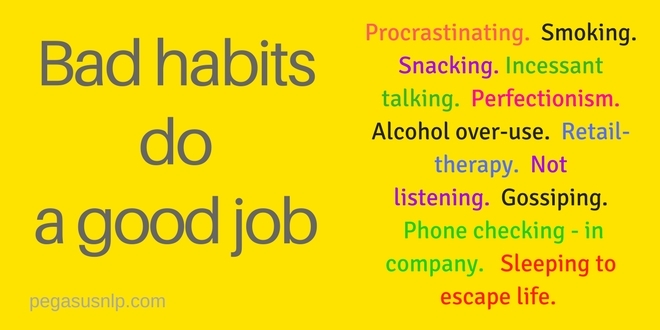 How can a bad habit do a good job?? A ‘bad habit’ often becomes an effective way of managing our feelings – one which, over time we come to rely upon as the ‘best’ way of doing this – that is its Payoff. And we call it a ‘bad’ habit because of the side-effects, the downsides. Downside: we don’t efficiently get things done, we upset others by not meeting targets, we get a reputation for being unreliable. Payoff: we don’t put ourselves under pressure – at least not until the deadline is near or has passed! And the habit gives us many ways of ‘not thinking’ about unpleasant tasks. Downside: we get a reputation as somebody who won’t keep a secret. Many people tend to avoid us. Payoff: we get close to others who like to gossip. It gives us things to talk about with others. Talking about other people’s lives enables us to avoid thinking about what’s not working or not happening in our own lives. Downside: our health is affected – snacks are usually unhealthy and fattening. Our appearance is affected. Eating can become an obsession – we feel anxious unless we are putting food into our mouths. Payoff: we are constantly ‘rewarding ourselves’ with food and drink – giving ourselves treats. This enables us to feel good or avoid feeling bad. Downside: others can get irritated because our incessant talking is often just a stream of uninteresting anecdotes – and because our chatter prevents them thinking clearly. Payoff: we dominate the conversation – and ensure that what’s discussed is to our liking. We prevent people getting too close or getting to know us. Downside: it can become expensive. We accumulate lots of stuff we don’t want. And sometimes leave ourselves short of money for essentials – which, in relationships, can cause tension. Payoff: we can buy excitement, frequently! The excitement of acquiring something new – whether this be big or small – each purchase gives us a temporary buzz. Downside: it can become expensive. It can lead to health problems. And it can isolate us from others who do not share our liking for alcohol. Payoff: it can be relaxing, a way of managing stress, and a quick way of changing our mood. Downside: we don’t get very much done. We find it very hard to finish things. People become impatient with our broken promises. Payoff: we believe that ‘if the job is worth doing it's worth doing… perfectly’ and this drive for perfection can be all consuming, distracting from from stressful stuff. Being a perfectionist is a great way of avoiding the criticism that we might receive if we actually finished the job. What to do about unwanted habits? To become free of a negative habit you need to identify its Payoff i.e. the benefits of the negative habit. This is critical: the negative habit is doing a good job – removing it means you won’t have a way of getting all those payoffs! You then have to find ways of getting the payoffs without the habit. Your aim is to ‘have your cake and eat it’. To find ways of having the good feelings (Payoff) and avoiding the bad feelings (Downside) whilst being free of the habit. In the meantime? Choose a ‘bad habit’ that you would like to be free of – one that you are determined to be free of. And begin thinking of all the benefits you currently get from this habit. This article originally appeared in The Pegasus NLP Newsletter - which has been published continuously since January 2001.